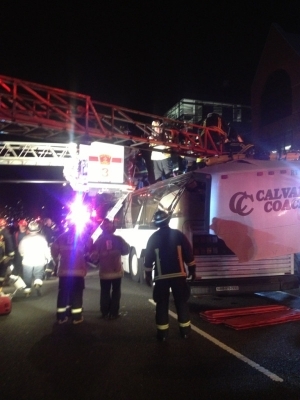 A Philadelphia-area chartered bus headed home to Bristol, PA carrying 42 passengers struck a bridge overpass in Boston and injured 34 people, 3 of them seriously. The bus was carrying students and chaperones visiting Harvard University with the Destined for a Dream Foundation. The organization works with underprivileged and disadvantaged young people. The trip was part of the program that builds leadership, discipline, and self-esteem. 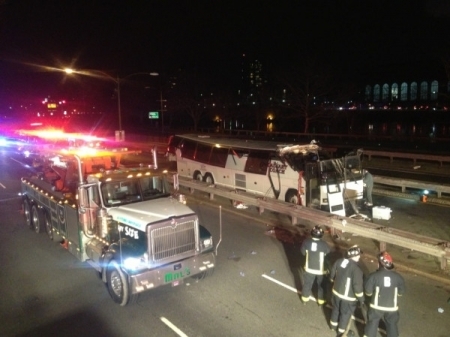 The bus smashed into the Western Avenue Bridge on the eastbound side of Soldier's Field Road that winds next to the Charles River. The bus was too high for that roadway. Boston firefighers had to free some of the injured because they were trapped after the accident. Massachusetts State Police will determine if the driver will face charges for not following height guidelines. Every high school student with hopes of going to college has taken the SAT. It's a challenging test that evaluates your verbal, mathematical, and now your written skills. About a million students take the test every year. Colleges use the scores as a baseline as part of their evaluation process for admissions in combination with GPA, extracurricular activities, and recommendations. It also plays a big part in student's chances of receiving scholarships and other merit based aid. A perfect score (now 2400) is a rare achievement. Only 360 perfect scores were earned last year. This year 3 students from Montgomery County, PA posted perfect 2400's. They all also happen to be classmates at the same school at Upper Dublin High School. Julie Baldassano, 17, of Maple Glen, William Raynor, 16, of Dresher, and Benjamin She, 16, of Ambler were all surprised to find out they tallied 800's across the test's three sections. It shouldn't have been too much of a surprise for these juniors, all of whom are at the top of their class with above 4.0 GPA's and enrolled in AP classes. It was a relief though and they were all very happy. Upper Dublin also had two other junior score a near miss 2380 on the test. Just to show you how hard it is to be perfect, those two students missed just one math question each. Hundreds of community members gathered today outside of Bryant Elementary School in the Cobbs Creek section of West Philadelphia nearly three weeks since 5-year-old Nailla Robinson was kidnapped from her classroom. Nailla was found early the next morning underneath a playground wearing only a t-shirt. Her abductors are still on the loose. The Women of Solidarity, made up mostly of mother and grandmothers including the abducted girl’s aunt Salimah Rashid, marched through the Cobbs Creek neighborhood calling for justice, imploring the perpetrators to turn themselves in or for neighbors to provide information, and relaying a message of peace. They ended the rally with a release of white balloons symbolizing innocence. If you have any information about the abduction, please contact Philadelphia Police. The reward is now $85,000.